As I review the statistic of my brazo de mercedes, I found out that it became one of my popular recipe on my blog. So, me and my wife decided to make this brazo de ube, a version of the brazo de mercedes using an “ube or purple yam’ filling. Purple yam for some who does not know yet is a kind of sweet potato which is purple in color. The procedures and ingredients is same with the add-ons of “ube or sweet purple potatoes”………………….Did you know that purple sweet potato has the highest nutritional value compared to other vegetables. Its vibrant color is a clue to its high concentration of Vitamin A in the form of beta-carotene. One sweet potato contains five times the recommended daily allowance of Vitamin A, a powerful antioxidant that protects against free radicals and helps guard against smoking-related diseases like emphysema and lung cancer. Sweet potatoes are also a good source of Vitamin C and the trace mineral manganese……. In a mixing bowl, pour in egg white and cream of tartar and mix using an electric mixer until soft peaks form. add in caster sugar in small quantities and whisk. 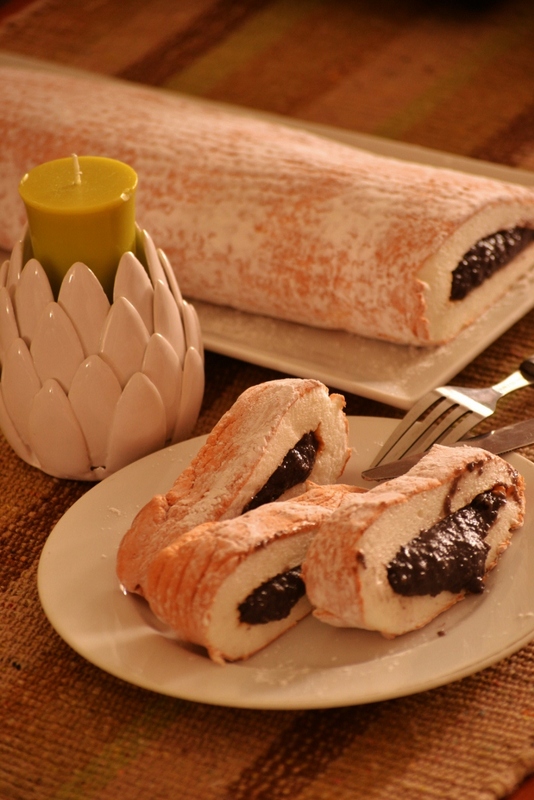 Then slowly roll over the cake to form a cake roll look-alike. Be gently. Place in fridge for minimum of two-hour. Posted on February 24, 2012, in Cakes, Sweets and Pastries and tagged brado de ube, Brazo de mercedes, purple yum, purple yum cake, Ube cake. Bookmark the permalink. 8 Comments. Wow. I’ve never seen this before. Or even heard of it. It’s beautiful! this is really awesome jennifer…must try!!!! Pre hindi pa ko nakakatikim niyan a! Great variation on the Brazo dessert!